Do you sometimes forget how much you like an old recipe? Potato and Bacon Hotpot must have been one of the first things I made as a student – pure comfort food, it really comes into its own in the winter months when having something cooking for supper in the oven is almost mandatory. But, it’s been at least a couple of years since I made it and the revival of my Potato and Bacon Hotpot with leeks is all down to a Jarlsberg cookery event. 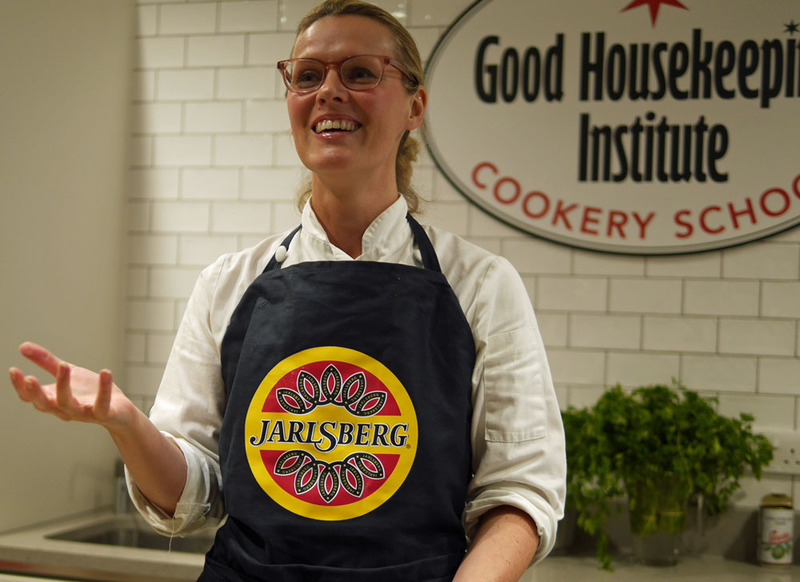 A month or so ago I was invited to the Good Housekeeping Institute to meet Signe Johansen and some of the people from Jarlsberg Cheese all as part of the Jarlsberg #makeasandwish campaign. We learnt that Jarlsberg is the product of a fusion of Swiss cheese making and Norwegian dairy produce that dates back as far as the 1820s when some Swiss cheese makers visited Norway and realised that the terroir would give the cheese a unique flavour. The cheese all but died out until 1956, when a group of students and scientists recreated the ancient recipe. The result, Jarlsberg, is a delicious cheese, ripened for a minimum of 12 months, which is versatile enough to work as well in an everyday sandwich as it does in a whole variety of dishes. 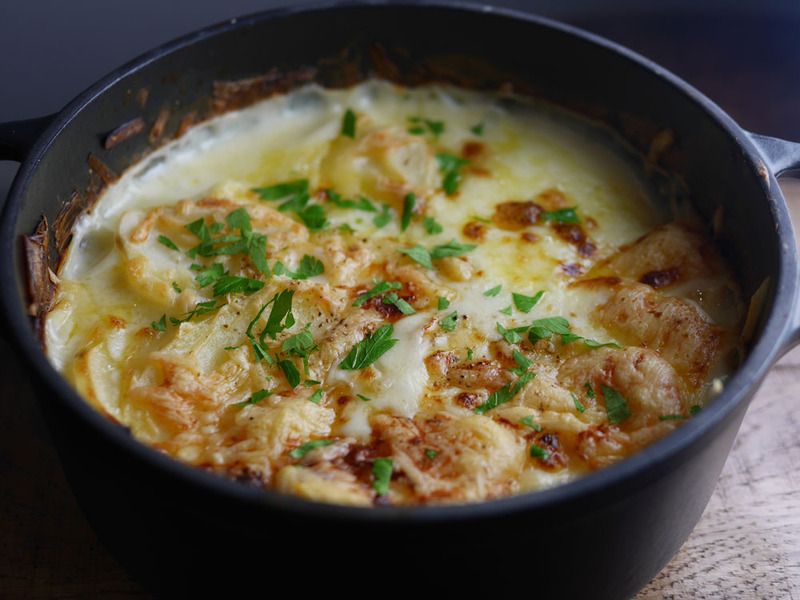 It’s the perfect cheese to use for cooking which makes it ideal for a Potato and Bacon hotpot! Signe Johansen helped us to create a new twist on macaroni cheese – she showed us how to make a lighter mac, using stock instead of milk and adding no flour. Of course, the cheese used was Jarlsberg. Then we used the mix as a stuffing for tortillas, pimping the mixture up with everything from mushrooms and ham to a hot chilli sauce. 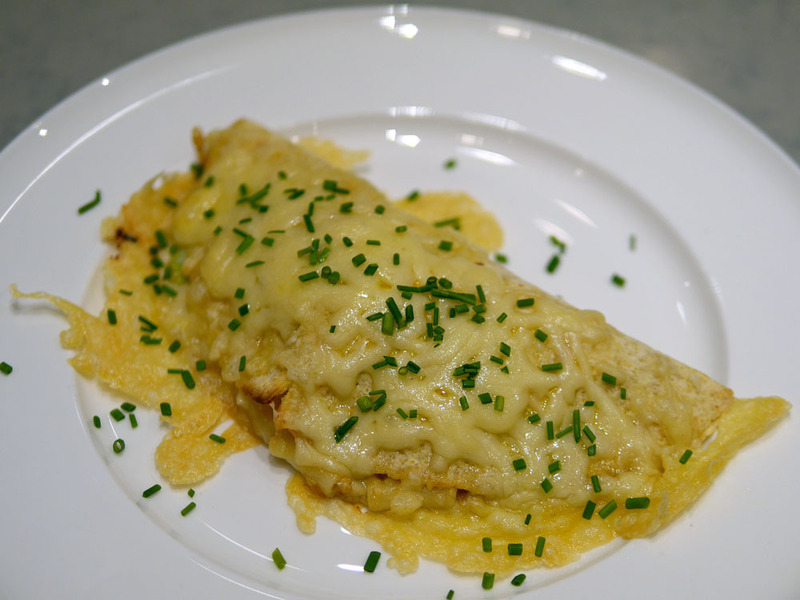 Jarlsberg is a great cheese to use for cooking, it melts very easily and can be grated as a topping then browned off in the oven for a delicious golden crunchy topping. We took some cheese home and I decided to make one of those recipes that I’ve cooked since student days. 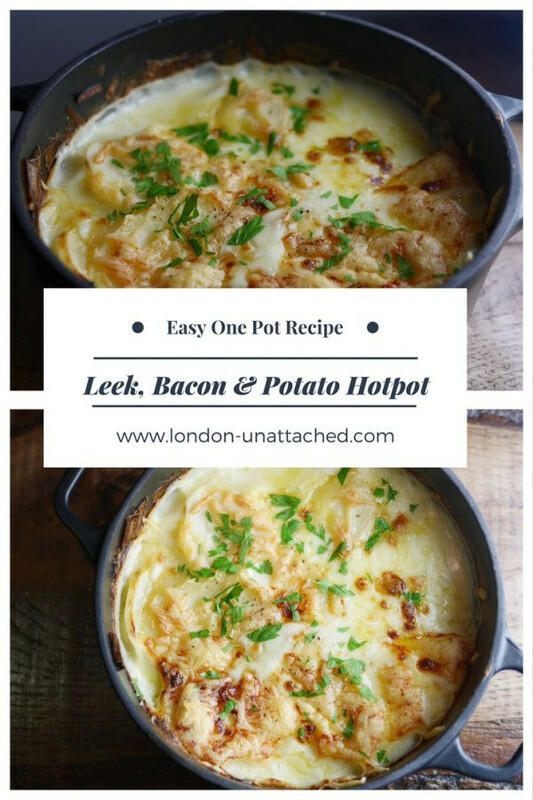 The basis of this dish, here made as a potato and bacon hotpot is a very frugal way to use up a little leftover bacon, ham, chicken or sausage and the end result is comfort food that I’m happy to eat over and over again. It’s just a question of thinking of ingredients you know will pair well together. Leek and Potato, for example in a winter soup, are a perfect pairing, though sometimes I’ll use a leek, sometimes shallots or onions. I’ve also made the same dish substituting the potato with celeriac. The only essentials are potatoes and cheese. But here, I think there’s a pretty good ingredient combination, with bacon, potato and leeks to add sweetness and lighten the dish a little. This Potato and Bacon hotpot is a very simple one-pot supper dish made here with leeks. Change it up by using sausage or cooked chicken instead of the bacon, or by omitting the meat altogether for a vegetarian option. If you don't have leeks to hand, use a finely diced onion. Add the rest of the butter to the pan and melt. Add a layer of potatoes, then a layer of grated cheese, then a layer of bacon and leek. Season with salt and pepper and continue layering, reserving about 1/4 of the cheese and finishing with a layer of potatoes. Pour over the milk and stock and stir the whole mixture gently so that the layers are mixed up a bit. It’s a pot of gooey, rich, comfort. Leek, Potato and Bacon Hotpot is something to eat on an evening when you don’t want to stress about dinner but you DO want good, homemade food. Try eating it with a crunchy green salad or with a helping of ratatouille. Or enjoy it as it is, straight from the pan. 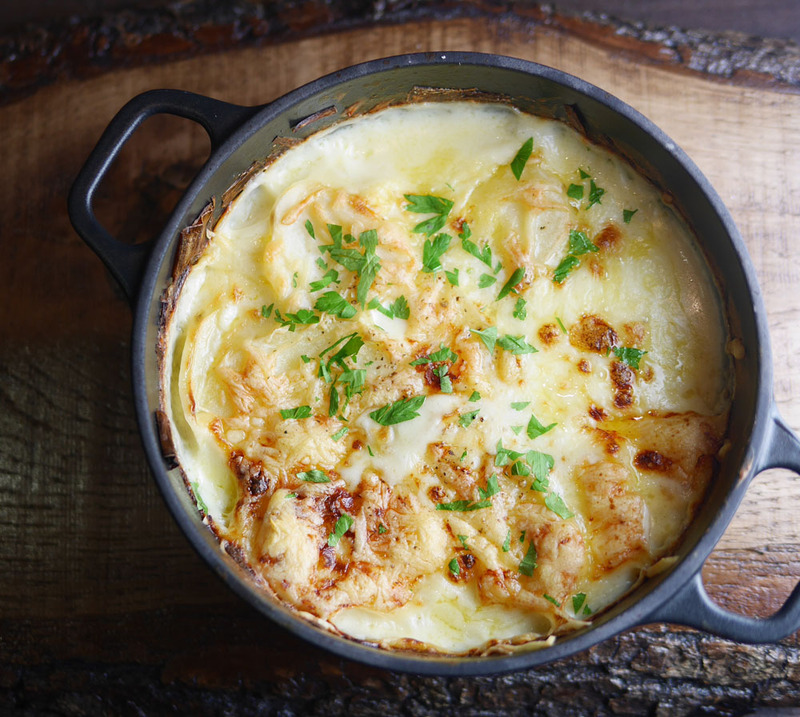 I’d call this a hotpot simply because I make a deeper pot of it that a standard gratin – but if you wanted to, it could easily be cooked and served in a shallow gratin dish – just reduce the cooking time accordingly. 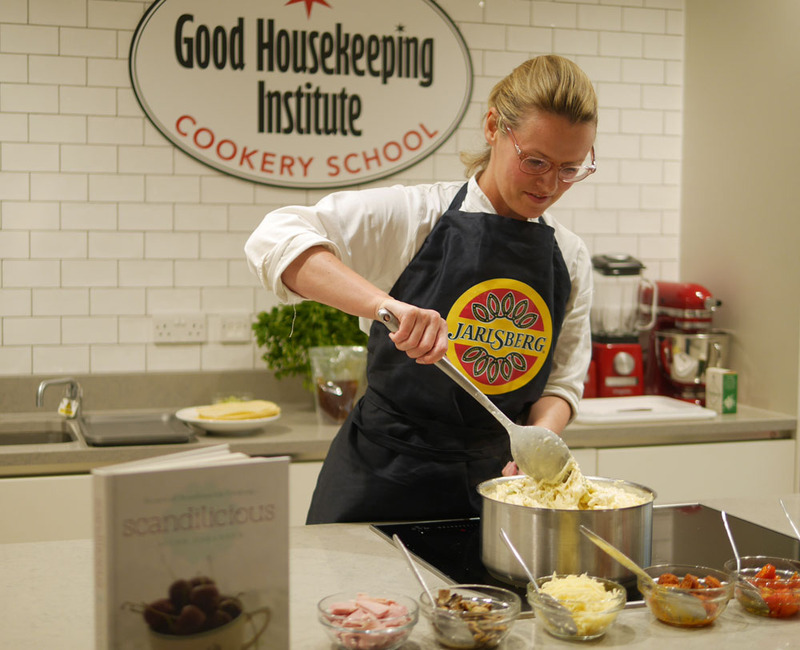 With many thanks to Jarlsberg for my samples of cheese and for a great evening cooking with Signe Johansen. And for the inspiration to recreate Leek, Potato and Bacon Hotpot a dish I use to love and have discovered a new passion for! Sounds delicious – a perfect easy supper! Yes indeed – and very frugal too! I love one pot meals and this sounds great. I would make it by omitting the bacon and maybe add mushrooms to make it vegetarian. Oh my god, that looks divine! Sometimes being lactose challenged is harder than others, this is one of those recipes that makes it blatantly obvious what I’m missing out on! You could try making something similar with stock, potatoes and leeks – it would just need a good topping of some sort?